Looking for beautiful decor or gift for that special someone in your life? This beautiful holder can be placed anywhere in your home and it is sure to bring lots of compliments! HOME IS WHEREVER I'M WITH YOU OR YOUR CHOICE OF WORDS. Do you have a special quote that you would like us to engrave? No problem just contact us! Want it engraved in a different language? NO PROBLEM just send us what you would like engraved exactly how it's spelled in your language and we will engrave it for you! 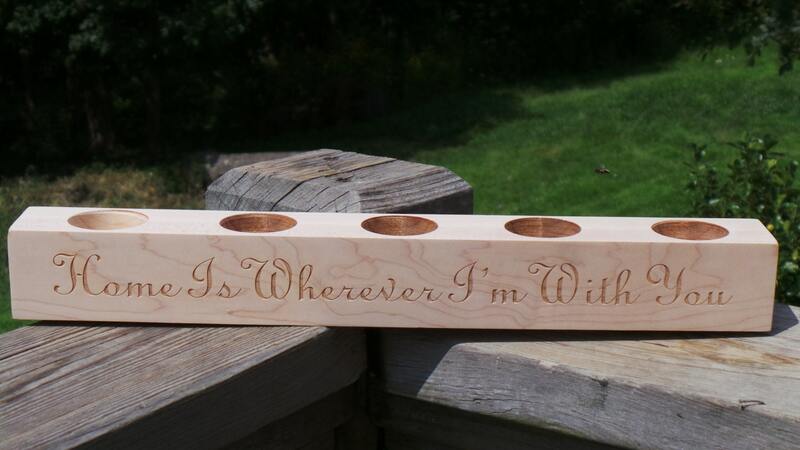 Each holder is made and engraved by us. Shown in white oak wood. Other wood types available. This candle holder is aprox. 15.5 " long X 2" wide X 2" tall. Each candle spot is 1.5" diameter. Please let us know your initials and date at checkout. Also let us know your need by date.